Screaming Bee LLC is pleased to add plug-and-play hardware controller and custom hot-key support to Voice Again™ software. 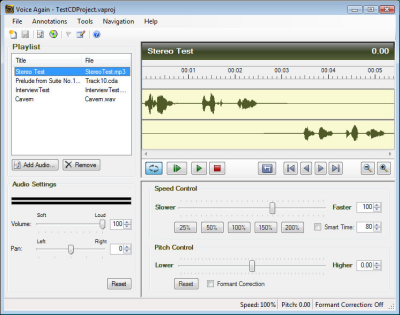 Slow down audio recordings without changing the pitch. The software is designed for analysis and transcriptions of dictations and interviews. Voice Again now has plug-and-play support for the latest foot controllers, including the VEC Infinity In-USB-2 foot pedal. Users simply plug the USB device into their computer and Voice Again automatically detects and configures the required navigation settings.